We’ve all seen them; those annoying messages that crop up on screen when we try and bring up a website. But do you know what they mean? 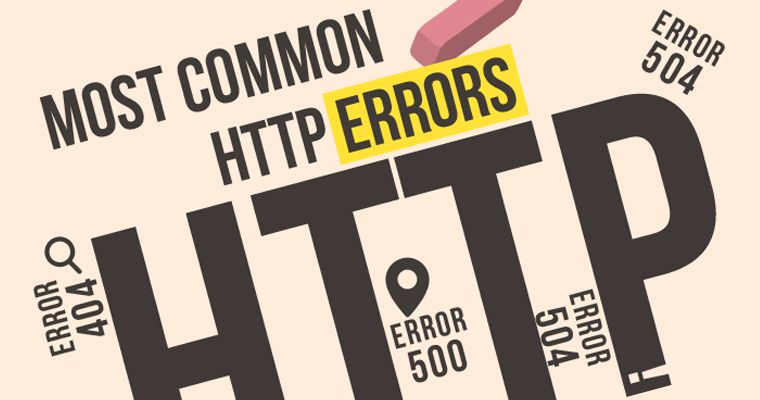 We researched the many HTTP error messages in use, and the following is an explanation of each one in simple terms, together with advice on what to do when you are party to that message. This error message indicates that the particular site or other resource you are trying to access is no longer in that location. You will see the code plus a choice of new locations. The message could be caused by an incomplete URL or one that includes other locations within it; perhaps a list of ‘inner’ pages that may need to be individually selected. What to do: in the first instance, enter the URL you are using in the browser. You may see a web page asking you for another action; if this is case, you are using a URL that the browser considers to be short on specific detail. Select one of the choices offered to proceed, or send the website a message if you are concerned. This indicates a permanent relocation of the URL. The site or resource you are trying to access is no longer at that address, and the message should include the new location. Users should use the new address given in the message. What to do: a 301 message should include the new URL; if so then the browser ought to retry accessing the new URL. Users should, in fact, not actually see a 301 message if it operates correctly, as reconnection should be automatic. There are occasions when corruption can lead to incorrect response from a 301 message. If this is so, contact the webmaster and inform them of the problem for ease of use in the future. The most commonly experienced redirection message, 302 means that the server believes the URL to have been redirected, temporarily, to an alternative address. The location of the new URL should be included in the message, and redirection should be automatic, as above. What to do: as the required site or resource is located for the time being at an alternative address, the user should still use the original address and the request will be redirected. Alternatively, the server should show the new URL at which to access the information required. This code is telling the user that the response can be found at a specific URL, as will be displayed. That URL should not be cached as the original URL has not been moved. The new URL is not, it should be stressed, a replacement for the one used; it simply is using a new URL for reasons the user may not be party to. This message may be seen quite frequently, as it is a much used method of redirection. What to do: first and foremost, never cache the new URL, simply use it – if not automatically redirected – as the destination. if not using a HEAD request method, a hypertext note should be included in the response, or contact with the website at the relevant email address should be made. Not strictly an error message, 304 merely tells the user that no changes have been made since the URL was accessed previously. Some web browsers do not allow for 304 messages, hence seeing one means that you browser does so. It is helpful in understanding whether information at the URL is up to date or has been modified. What to do: a 304 message will, in most cases, send the user to the website requested as it is for information only, as it understands that the site has not been changed. Any problems, contact the website at its relevant email address. The 305 code is informing you that the site or resource you are requesting must be accessed via a proxy, and this will be given in the message. Basically, your web server believes that the URL you want is via proxy, possibly down to reasons of security. This can be a problematic code and is often dealt with incorrectly. What to do: in the location field you will find the address of the proxy URL; simply use this to access the resource and bring up the information required. This 300 code is now defunct. Quite simply, a 307 error informs the user that the URL requested is temporarily available at an alternative URL, which will be outlined in the message itself. Users should redirect as instructed, but use the original URL in future. What to do: use the temporary URL to access the required information; the message may include a hyperlink to the new URL for the use of the user. This is a common error indicating that the information you sent to the server, the website address perhaps, is not able to be processed for one of many reasons. The error message will be seen within the browser window, and will occur within any operating system. a) Most often the 400 error is displayed thanks to incorrectly typed website addresses, or malfunctioning links. Check the spelling of the address carefully and look for characters that are not typically present in addresses. b) Perform a clear on your cookies; this is most likely to work should your 400 error refer to a Google request. Cookies can be corrupt or out of date. c) DNS records stored on your computer may be out of date, so clearing your DNS cache may solve the problem. Use the ipconfig/flushdns prompt in Command Prompt on Windows. d) Your browser cache may contain corrupt versions of the web page required, hence could be the cause of the 400 error. A quick and simple clearing of the cache could solve the problem. e) It is not common but a 400 error could mistakenly refer to a gateway timeout, in which servers take too long to respond. f) Should the above not be helpful you need to contact the website concerned. Sometimes a 400 error is at their end of the chain, and not yours. Send them an email informing them of the problem. g) The security of your device should always be kept updated; make sure you install all updates from Microsoft, and invest in anti-virus software as a matter of course. Poor security can lead to problems that relate to 400 errors. h) If none of the above help it could be that you need to come back in a while and try again; the problem is with the website, so they will fix it in time. This commonly seen code tells you that the resource you were requesting requires a password and user ID. You have either not logged in with those, or you have given incorrect information. You will see it within the browser window, and on any operating system. a) You may have entered an incorrect URL or you could have been trying to access a part of the site reserved for authorized users only. Check the URL you have entered is correct. b) Search the website’s home page for links to ‘Login’ or ‘Secure Access’ and enter your password and user name as requested. Should you now already have those, there will be instructions on how to register. c) Should you believe that such authorization is not necessary them you may be seeing a 401 message mistakenly. The answer is to contact the website directly and tell them the details of your problem, for others may be having the same problem. It’s worth knowing that the webmaster may usually be found at [email protected]’insertwebsitename.com’. d) If you get the message after logging in it is possible your information is incorrect. There will be directions on the website to reset your information. An as yet unused code that is reserved for possible use in the future. This strict message says that the information you are trying to reach is forbidden to you. As above, there are many reasons why you might see a 403 Forbidden message. a) First, make sure the URL is correct and that the page you are looking for is an actual page; do not get confused by directory addresses, which are likely to be forbidden in most websites and will naturally return a 403 when requested. b) It could be that a previously cached version of the page you are looking for is the problem; clear the web browser cache. c) If you are logged into a site and are seeing a 403 when requesting a page, it is probable that you do not have the authority to access that particular information. d) Cookies, out of date or corrupt, can also lead to a 403; clear your browser cookies and try again. e) The 403 could be as a result of problems at the website, so let them know of the problem via email. f) Sometimes IP addresses – and occasionally ISP’s – are blacklisted by websites; this could be a cause of a 403, so check with the website concerned. g) Try again later, especially if you are aware that the 403 error is not just occurring for you. It could be they are aware of the problem and working to fix it. A 404 error tells you that the page requested simply could not be found on the website’s server. It could be that you are trying to find a page that has been removed, or it might be that the website has failed to inform you of a redirect or has not performed it correctly. A 404 will occur if this is the case. a) Use the F5 function to retry loading the page, or retype the URL in the address bar and try again. Sometimes refreshing the page can eliminate a 404 message as there is not actually a problem. b) Make sure you have typed the URL correctly as incorrect spelling or unnecessary characters can result in a 404.
c) Move up through the directories by eliminating the sections in the website address: i.e. if you began with www.website.com/x/y/z then try www.website.com/x/y and so on, until something loads. If all that can be loaded is the Home page, try and use a search function to find the resource you require. If there is no search function, use navigation by the links on the home page. d) Use a search engine and you may find that you are entering the wrong URL; once you find the correct one, be sure to bookmark it so that you do not get repeated 404 errors. e) If you find that you can reach the resource on one device but not on another it could be that your browser cache on the troubled device is causing the problem. Cookies can also have the same effect, so clear them both on the problematic device. f) You could try using different DNS servers to access the website, especially if the entire website is returning a 404, which is not a common occurrence. Sometimes censorship can return a 404, in other words you may be trying to access restricted content, and a DNS server change may help. g) If none of the above fixes the 404 let the website known by email or other forms of contact, as they may not be aware that the error is present. They will be pleased to receive the information and will set about fixing it. However you are trying to access the information you require, it is not permitted. You may be using a GET method where POST is required, so you need to check the request method. The response should include a list of valid methods. What to do: check the script you are trying to run is supported by the ISP, as some do not allow them to be run. This will return a 405. It may also be that the form you are trying to use is not permitted; for processing forms, some methods are not supported by certain ISP’s and will return a 405. Your ISP should have the information required, or you can contact the website direct. When a user makes a request to a browser, the browser then files that request to the server; a 406 error says that the format used is not acceptable to the server, so the information returned is the error message. This error can also result from certain firewall applications, which look for set rules that need to be adhered to. What to do: if the problem is with said firewall – known as Mod_security – the system can be disabled. If you are technically minded and have access to the source codes and data streams, plus the Access Headers, you may be able to deduce the cause of the 406, but it is probably best to contact the technical support team responsible for the system concerned. Although the information sent to the web server is correct, the system has detected that to process the information requires the use of a proxy, which will require a password and ID for authentication. What to do: your ISP should be able to provide you with the relevant information on available proxy servers, or you could try navigating to the resource by another method, perhaps an alternative URL for the proxy server list. Contact the relevant parties if problems persist. When a web server detects that an inordinate length of time has passed between either a connection to a web browser or a socket, it will ‘drop’ the connection and return a 408 error message. As the request has genuinely been timed out, the user must retry in order to connect. There are set time periods that website servers will wait for a connection, and a 408 will be the result should this be exceeded. a) Refresh the website or re-enter the URL; slow connections are not unusual but are generally temporary. Be careful of doing this many times when using online shopping carts; it has been known to create several orders by mistake, and hence take many payments. It is to be noted that online merchants do tend to have protection against this installed. b) It could be that it is your internet connection at fault; if you suspect this, try an alternative website and see if it loads. If the other page loads as normal, it’s likely the issue is not with you, but with the website concerned. If others are slow you could run a speed test and see if there is a problem, or contact your ISP to see if they are experiencing problems. c) 408’s can occur when a website receives an unexpected increase in traffic. This can give the servers a hard time and result in problems. Once traffic dies down you may find the site loads as normal, so try again later. d) If you continue to have problems, or are aware that others are also finding a 408, it is advisable to contact the website and let them know the situation, as they will want to rectify it as soon as possible. The information you are trying to request has resulted in a conflict, hence the 409 error. For instance, if you try and upload something that is older than that in existence you will create a conflict in version control. Also, if you are trying to perform an action that is beyond your granted authority it may generate a 409 error. What to do: you must contact your ISP and find out why the conflict is occurring, either by email or by other means, as only they can resolve the problem. This very definite error code is returned when you try to access a page or site that is no longer available, or is deliberately hidden from view. Such pages should have been removed from the index by search engines, but may have been overlooked. This is a permanent situation – the resource is simply not there anymore, and no alternative URL has been given for it. What to do: there is pretty much nothing you can do about a 410 error; as the page or site is no longer there, and there is no redirection address, it cannot be accessed. If you believe the URL should be live then you may try and access it from a different angle, but you will most likely see another 410. This HTTP error is usually only applicable when you are trying to add data to the web server rather than find it. All such transactions will require a length to be specified, and a header will be offered in which to define it. If the length is not defined, the system will return a 411 error. What to do: it is best to contact the ISP and ask them for the relevant information, unless you are technically adept enough to work out what the system is having a problem with. All requests to servers contain certain conditions specified within the Request Header field attached to the request; a 412 error indicates that something within these parameters was not within the conditions required, and hence has been rejected. A 412 can also be returned in the event of suspicious or bad request parameters. What to do: in the first instance, try again using an alternative browser as this often works. Also, if the website is under your control, turn off such as mod_security, or alter the set rules. If this is not the solution, talk to your ISP to deduce why you ate getting a 412 error. A 413 error simply indicates that the information you are trying to send to the server was simply too big; perhaps you were trying to upload a large file or similar. The server will have set parameters as to what is considered too large. What to do: it is recommended you contact your ISP for information on the limitations with regard to 413 errors. URL’s are generally expected to be within a set length, defined in characters, and can sometimes be decreed as too long. Should this be the case you will see a 414 error. You should be able to find out the maximum length of a URL set by your web server, and it is helpful to keep it as short as possible in order to help with the processing of information. What to do: hyperlinks are often lengthy and convoluted, and can constitute the problem or a 414 error; clearing your cache may help the situation, but you may need to contact your ISP and find out exactly why the system is rejecting the URL and if it is actually valid. This code implies that part of the request to the server included a format not supported; it could be an image or another media file o a type that the server cannot deal with. What to do: the best solution is to find out from your ISP the media formats that are supported and try to make the request using one of these. This is one of the more commonly seen error messages as it covers a range of problems; it simply means that there is a problem on the server relating to the website, but is not specific about it. In other words, it’s not your problem, it’s theirs, and it could be down to a programming fault. a) Try refreshing and reloading the site by either the refresh, F5 or typing in methods, as the problem could just be temporary. Be careful when doing this while checking out on a shopping site as, although there are usually security provisions in place, it can result in multiple purchases. b) A cached version of the page you are trying to view could be the cause of the 500 error, although it is not a common problem. However, it is worth clearing the cache as it has been known to relieve the problem, and it is quick and simple. c) Cookies may also be the problem, so again, deleting cookies on your browser can be a quick and effective way of alleviating a 500 error. d) Sometimes a server will return a 500 error when the problem is actually a 504 Gateway Timeout error (see below); try the advice there to see if it helps. e) If none of the above work then it may be advisable to let the relevant persons at the website know, as they may be unaware of the problem and will wish to fix it. f) Try again later, as the 500 error may be the result of a temporary problem already known to them. This message tells you that the method you are using to request the information cannot be processed by the server, either because it doesn’t understand it, or has not been told how to do it. What to do: you need to make sure you are using a request format that is valid, or the server itself may be outdated and need updating. The 502 error also covers a lot of possibilities, and informs you that a server needed to perform the action requested has returned a response that was not valid to the operation. Note that a 502 error is, more often than not, a problem experienced by two servers trying to communicate with each other; this means it is not a problem with your system, or with your connection. It could be that something you are doing is influencing the problem, so it is best to try the following just in case. a) Reload the URL once more, either by refreshing, using 5 or by typing the URL again; it is entirely possible that the problem is temporary and short term, and this first step often works. b) Close your browsers and open a new one, and now try to load the website. If the problem was on your part, or that of your browser, this simple act should solve the problem in an instant. c) Old or corrupt files that are cached on your system can produce a 502 error in some circumstances, so emptying your cache may be the simple answer to the problem. d) Also, cookies may be the problem, as above; clear cookies and you may have the answer. You can clear those that are specific to the site concerned if you wish not to clear them all. e) Use the Safe Mode option; by starting your browser in Safe Mode you are doing so without any other add-ons that may be having an effect on the 502 error. If this solves the problem you have an indication that it is an extension or otherwise relating to your browser that is at fault. Search through the settings until you find the setting that is causing the problems. Please note, this is not the same as Windows Safe Mode, it is that specific to your browser. f) You may want to try a different browser if the problem persists; Chrome, Firefox, Internet Explorer and Safari are among the most popular, and you might find that a different browser, for certain reasons, overcomes the 502 error. g) The old restart trick might also help; sometimes rebooting your machine will remove the 502 error, as the problem could have been due to your network connection. This will possibly be the case if you are seeing a 502 on more than one site. h) Further to the above, rebooting your router, modem or any other devices on the network may solve a 502, as they could be causing problems in the way they are connected. Make sure that, when you turn them back on, you begin with the modem, router, and then any devices between that and your computer. i) Some issued with DNS servers can cause 502 errors, so it may be worth changing to a different DNS server. These are assigned to you by your ISP, who may be able to help you if you are not sure what to do. j) If problems persist it may be helpful to contact the relevant persons at the website as they may not know about the 502 error, or may already be working on rectifying the problem. k) If everything in your home network is operational and the website personnel cannot see a 502, you should contact your ISP as there may be an issue with their network could be the cause of the problem. l) As with all things, try again later on; if the website administrators are aware of the problem they will be trying their best to fix it, and will do so in good time. Remember, it is more than likely that a 502 error is not your fault, but is a problem with the website’s network or that of your ISP provider, but trying the above will do no harm at all. This often-seen error message carries a simple message: the server for the website you are trying to access is not available at that moment. It could be due to heavy traffic or maintenance. a) Try the website again by either refreshing, pressing F5 or typing the address once more, as it is entirely possible that the 503 error is a temporary one and, in many cases, this will solve the problem. Take care if doing this when making a purchase as, although security measures are usually in place, it can result in multiple purchases. b) Reboot your router and then your computer; this is recommended especially if the error message reads ‘DNS failure’. It is still the greater likelihood that the problem lies with the website’s servers, but in some cases it could be one of your devices that is malfunctioning and this could solve the problem. c) Contact the website and let them know of the problem; they may already be aware but if not they will welcome your message and begin to rectify the problem. d) Try again later on; this is probably the best of all options because, as the problem is out of your control, those responsible for it will likely be working on it and after a while the service will likely return to normal. It could also be that the 503 is down to an unexpected influx of traffic, in which case you will be able to access the site when they leave. This common error message tells you that the server your request is trying to communicate with did not respond in good time, most likely due to maintenance or a fault. b) Further to the above, rebooting your router, modem or any other devices on the network may solve a 504, as they could be causing problems in the way they are connected. Make sure that, when you turn them back on, you begin with the modem, router, and then any devices between that and your computer. c) Some issued with DNS servers can cause 504 errors, so it may be worth changing to a different DNS server. These are assigned to you by your ISP, who may be able to help you if you are not sure what to do. d) Contact the website and let them know of the problem; they may already be aware but if not they will welcome your message and begin to rectify the problem. e) If everything in your home network is operational and the website personnel cannot see a 504, you should contact your ISP as there may be an issue with their network could be the cause of the problem. f) Try again later on; this is probably the best of all options because, as the problem is out of your control, those responsible for it will likely be working on it and after a while the service will likely return to normal. 505 HTTP Error (HTTP Version Not Supported) – the website you are trying to access does not support the HTTP protocol that you are currently using, which is commonly HTTP/1.1. What to do: you need to upgrade your web server software, in order to be able to access the website and others that may also return a 505 error. So, that’s it, all the error messages, what they mean and how to go about fixing them. We hope this guide comes in useful and makes your online life easier.